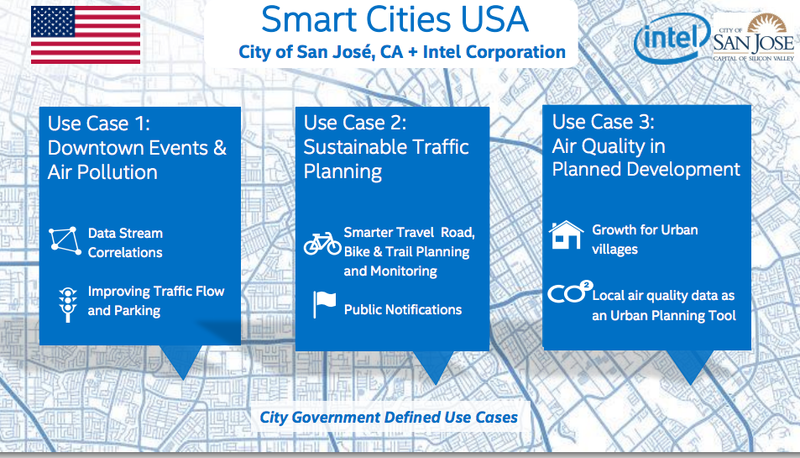 In the wake of Intel’s deal with San José, what makes a smart city? As the internet of things hype heats up, we’re seeing an array of deals signed between governments and big tech providers that purport to create some type of smart city. But in looking at these deals there’s very little consistency, so its worth taking time to figure out what actually makes a city smart as opposed to just making it connected. On Wednesday, Intel said it is part of a pilot project with the Silicon Valley city of San José, California, to add a network of connected sensors in various places as part of an effort to communicate information about air quality and encourage citizens and the government to act sustainably. The city is starting out with three projects: one related to how downtown events affect air quality, a sustainable traffic planning effort and a plan to use air quality data in making decisions about where to put housing in urban areas. San José has installed a sensor demonstration platform using an Intel gateway server (it has an Intel-based Quark chip inside) to take in existing sensor data that might be in older formats and convert it to a more modern format before sending it to Intel’s Hadoop cluster in the cloud. The sensors are from third-party vendors and talk to the Intel-powered hub. Intel’s rationale here is not only to help its neighbor San José meet its goals of saving energy, it’s also about the anticipated $41 trillion cities around the world are expected to spend in the next 20 years upgrading their infrastructure. 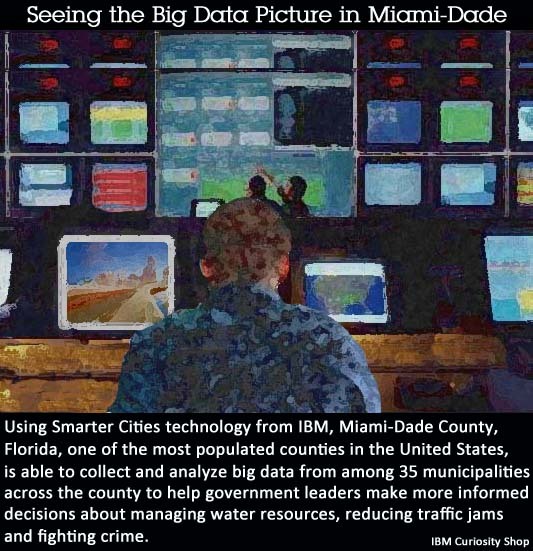 In Miami-Dade County, IBM has managed to sign a “smart cities contract” where IBM helps manage information coming in from 35 different agencies via a dashboard. Cisco, too, has a smart cities initiative that it has been investing in, most recently in Kansas City, Missouri. Earlier this year Cisco signed a partnership with Switzerland’s AGT to advance the Cisco smart cities platform. That move made sense, especially since Europe has been investing more heavily in connected cities, both at the municipal level and in pilot projects implemented in select neighborhoods. But before we embrace the marketing language of these giants in talking about smart cities, it’s worth taking a look at how these projects are evolving to see if they are really going to change how we move around and build our cities or if they will just pad the balance sheets of big tech organizations. In writing about connected platforms there are four important issues any organization has to deal with. Once an entity decides that it wants to connect its office, city or home, here’s how it should plan to move ahead. Where does this platform draw the line between openness and usability? Every connected platform makes a tradeoff between true openness and ease of use. While in the home it may make sense for a consumer to accept that convenience is worth living in a closed system, but when it comes to municipalities it would be shortsighted to spend big on proprietary gear and software just to avoid paying high quality programmers to stay on staff and help troubleshoot and design new systems as time goes on and the networks get more complex. As part of the discussion around openness I think it’s also worth talking about how the sensors are accessed and how their data is shared among citizens. If my city has an air quality monitor near my house, I’d like access to that data; not just because I want to know the air quality of my home environment, but also because I might want to test how it is working compared to my own air quality sensor. One might even argue that I should be allowed to somehow certify my own air quality monitor and have it send its data to the city to both offer more data but also to cut down on costs associated with covering a city with sensors. A startup called Thingful has a platform that hopes to do this. Meanwhile Opensensors.io has a software and consulting effort designed around letting cities own their data and build on top of it. Once you have a system or maybe a collection of sensors and some software, it’s time to start deploying it and figuring out how to make it work. This isn’t a neat process, even if it’s a proprietary product from a big vendor. For example, when Celebration Health, a Florida hospital, implemented a real-time staff and patient monitoring system, they spent a year troubleshooting problems. A variety of issues were discovered, such as the fluorescent lights in the bathroom interfering with the hubs used to track employee badges. The point is that a network of sensors is inevitably going to be complicated and allocating a lot of time to makes sure it works makes sense. Also, expect that things will change over time as you add new sensors or update software. As these networks evolve, advances in AI should help CIOs monitor and plan these million-node networks. Splunk is one company easing into this space as is Mnubo. What are we going to do with the data? Here’s where things get tricky. Even if the software or sensors are open, how will you handle the data generated by these devices? In the home, generally a consumer can export their data but doesn’t actually own it in the sense that he or she can monetize it. In the corporation it’s the opposite. For cities, having open data should be the starting point, and as I noted a few paragraphs ago, I think it may even be possible for cities to be open to using other people’s data for some applications. And openness doesn’t mean a CSV file, but ideally a structured API that citizens and developers can use to take sensor data and create new services using it. Should some sensor data be kept offline or in the dark? Probably, but I think cities and the courts should develop regulations and laws that assume openness and require cities to defend a decision to keep information hidden. And ideally I won’t have to file a Freedom of Information Act request to get the air quality metrics from the sensors near my home. This is the fun part. Once you have a system in place and it’s working and open, you or others will see all kinds of possibilities for improvement. Once you start seeing the how to put sensors and web services together to create new applications you can’t stop seeing them. As new sensors are introduced you see even more possibilities. That’s why it’s so important that this infrastructure is built to be open. And that openness, plus the ingenuity of citizens and staff, is what will really make a connected city smart.